Your Zodiac sign can tell you a lot about yourself. It can even tell you how long you will love someone. Each Zodiac sign has a set of very specific character traits which can influence their romantic life dramatically. 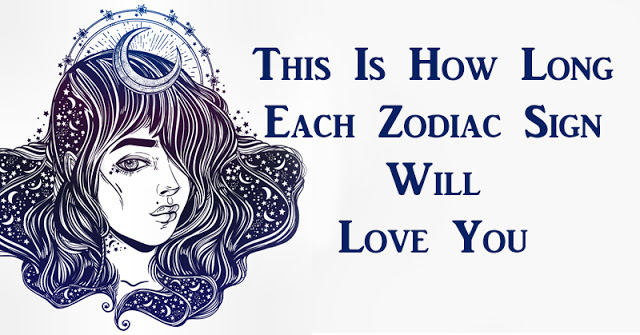 Get your sign and your lover’s sign ready because we have the definitive list of how long each Zodiac sign will love you ready just for you. Aries (3/21 – 4/19) – Will love you until you stop getting excited about life. The Aries is quite independent and courageous. Given this characteristic, they tend to be very enthusiastic and outgoing. The Aries is generally excited about life and they live to bring that excitement to others. An Aries will always love you as long as they can keep bringing you this excitement. The day you get bored of your Aries mate is the day they could stop loving you. Taurus (4/20 – 5/20) – Will love you until you start dragging them down. The Taurus is very stubborn but hard-working. The hard-working Taurus won’t stifle their productivity and stunt their growth just for a love interest. The Taurus will fight for what they want and if you don’t let them pursue their goals they will stop loving you. Don’t get in the way of the Taurus’s stubborn ambition. Gemini (5/21 – 6/20) – Will love you until you start trying to smother them. The Gemini is a social butterfly. The Gemini is very energetic and outgoing. Geminis are extroverts, they need to talk and socialize with people every day. The minute a Gemini isn’t allowed to roam free they will start resenting their captivity. Forget staying in on the weekends because the Gemini won’t tolerate it. Cancer (6/21 – 7/22) – Will love you until they think they aren’t loved back. The Cancer is known as being unpredictable. This unpredictability is only superseded by their desire for security. If a Cancer is completely secure in their relationship they are highly unlikely to ever leave it. The Cancer needs this security and if they don’t have it their love for you will fade. The Cancer needs to be constantly reminded that they’re still loved. Don’t let the Cancer think that they’re not appreciated and supported or they might let their unpredictable side shine through. Leo (7/23 – 8/22) – Will love you until you stop thinking they’re the best. The Leo is devoted, kind, and generous in the right condition. However, a Leo can also be very hot-tempered and the minute you start thinking less of them they’ll begin to stop loving you. A Leo can forgive you for most things but once they realize you don’t think highly of them they won’t be able to love you. Virgo (8/23 – 9/22) – Will love you until it doesn’t work out anymore. The Virgo is analytical and intellectual. A Virgo is kind but they’re also worriers and they try to be very practical. Virgos will love you until circumstances require them to stop. They love you but they also realize that they have to be practical and that things change. Libra (9/23 – 10/22) – Will love you until you start fighting with them. The Libra is the most diplomatic of all the signs. While a Libra may pride themselves on being able to settle conflicts easily they also hate it when they can’t solve them. Libras hate violence. Violence is never okay but the first hint of a violent tendency will infuriate a Libra. Scorpio (10/23 – 11/21) – Will love you until you betray their loyalty. Scorpios are the most intense of all the Zodiac signs. The Scorpio will always be loyal and passionate. However, that same passion is applied both ways. The minute you betray a Scorpio you will begin to see their wrath. Sagittarius (11/22 – 12/21) – Will love you until you start being pessimistic. The Sagittarius has an eternally positive outlook on life. This is really difficult for them to manage if their mate is constantly negative. This negativity will at first cause the Sagittarius to throw their positive energy into overdrive but when that doesn’t work the Sagittarius will ultimately lose interest. Capricorn (12/22 – 1/19) – Will love you until you lose your ambition. The ambitious Capricorn’s ideal relationship can best be described as a “power couple.” The Capricorn needs your drive to match their high ambitions. You don’t have to be as ambitious as the Capricorn but you can’t lose all hope. The Capricorn cannot stand watching someone waste their potential. Aquarius (1/20 – 2/18) – Will love you until you start to get boring. The Aquarius will love you until you start to be boring. An Aquarius dislikes boring and dull situations and they like having fun with friends and fighting for causes they believe in. The Aquarius is probably attracted to you for your intellectual conversation and ability to be a good, responsive listener. Continue to do this and an Aquarius will love you for a very long time. Pisces (2/19 – 3/20) – Will love you until you show the first sign of cruelty. The forgiving and loving Pisces will likely love you for a long time assuming you are just like them. The Pisces doesn’t like to be criticized and they don’t like know-it-all types. The Pisces is compassionate and gentle. The moment you stop showing compassion for others the Pisces will stop loving you.